A great place to start a blog as any I suppose? While you're all searching around for those platitudes to say, I'm fine, I've got my family, I've got my photos, I've got my memories, I've got my living genealogy through talking and having being passed on the memories and mementoes. My best memory of childhood is family holidays in and around Scarborough. Scarborough, Whitby, Filey and Bridlington are the fantastic east coast resorts where I spent many a family holiday. Born in 1943, Dad spent the last years of WWII with his grandparents in Scarborough whilst his parents saw out the last of the war, working. His grandmother would row out into the bay in her little boat to catch fish for him and the other soldiers who were staying there at the time; a wartime necessity that supplemented the meagre rations. One of my favourite things, as a child, was going through the box of photos that was kept in the bottom of his wardrobe. There were older photos, people who I had never known of, but our family holiday photos were also added to the mix; photographs were important to me then as much as now. Clearing out some of Dad's things, we came across this, which I honestly didn't know was still in existence. Yes the family camera, complete with sticky square of black electrical tape, put on to correct a light leak. 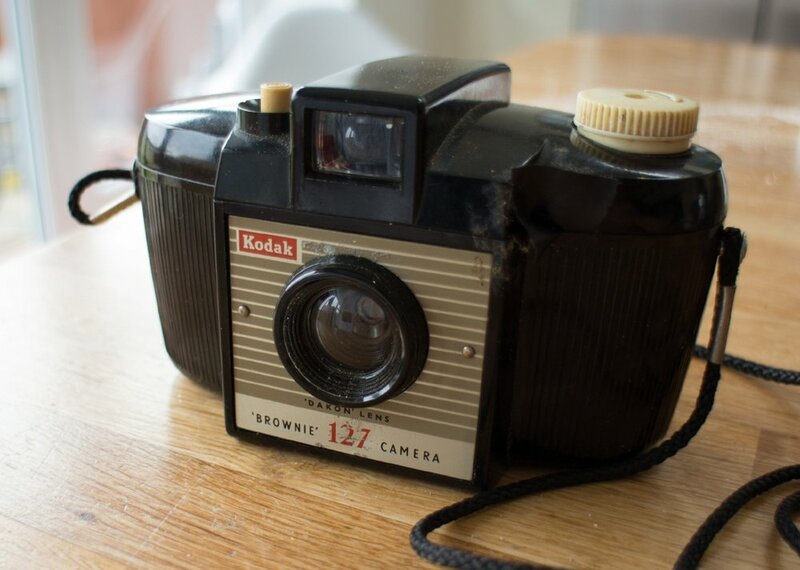 The very first camera I used, as an eager 11 year old, stepping forward to the front of the canal boat on a school trip as we went through the locks. So the camera is now mine, though sadly, it may gather dust while I pick up my much-loved Canon digitals that show instant results. A photo taken on the Brownie 127 by Dad, showing me, my mum and my 2 sisters at Kirkstall Abbey in Leeds. The photo has been digitally scanned but is much as it was when it was printed in 1973. So yes a bittersweet trip down memory lane. But it makes you realise that we need to exist in photographs, exist for our children, for our grandchildren and for many generations to come.